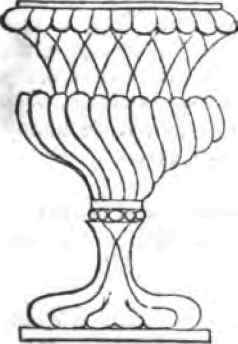 In the best plant houses, the pipes for heating the building are placed immediately fronting the ventilators, in the basement wall, so that all the air admitted into the house from below, must necessarily pass through, or come in contact with, these heated pipes, and, therefore, that great desideratum in ventilation, a circulation of warm air, is easily effected. This very important and highly necessary precaution should never be lost sight of by the architect in constructing horticultural buildings, too many of which, and even very modern ones, are built and ventilated without the least provision being made for warming the air admitted into them by the ventilators, and without a proper circulation of this in some way or other, no plants will flourish. Live they may; but when partially deprived of pure air, they only linger out their lives in a pallid, enervated, and undeveloped state, more of a disgrace to an establishment than a decoration. And let the opponents of a more free circulation to tropical structures bear in mind that even the most sultry forests, swamps, and savannas of the tropics abundantly afford to plant and animal life that which many a modern cultivator of exotics almost denies; for instance, nearly all our richest and most delicate Orchids inhabit regions in which, for nine months in the year, Aquarius is in the ascendant, and almost unremitting rains prevail. Everything depends on beginning right. In some plant and forcing-houses which we inspected lately in Philadelphia, the whole cost - and most extravagant was the outlay - has been thrown away by the absurd manner in which the work was executed. The costly hot water pipes in the grapery are useless for forcing, because of the openness of the glazing; the glass in extensive forcing-pits is so awkwardly glased in wooden rebates, thai when a pane is broken in the top or middle, all below it have to be forced out to replace the damage, and much time is lost, as well as glass broken, in the operation. It is no doubt the fact that the charge made by experienced superintendents of glass structures is as important a saving, as the percentage of an architect in the building of a house mostly proves an economy. Let no one attempt a glass structure without good advice. Mr. G. C. Thorburn, Newark, N. J., has just received an extraordinary lot of the newest and best Dahlia roots, new Verbenas, new Phloxes, etc. The Geant de Batailles is a marvellous Scarlet Verbena. David J. Griscom's nursery of evergreens, shade trees, fruits, vines, roots, etc., at Woodbury, N. J., is within an easy ride of Philadelphia, and offers, at this time, great attractions to purchasers. We recommend the worthy proprietor for his enterprise, and know him to be every way reliable. 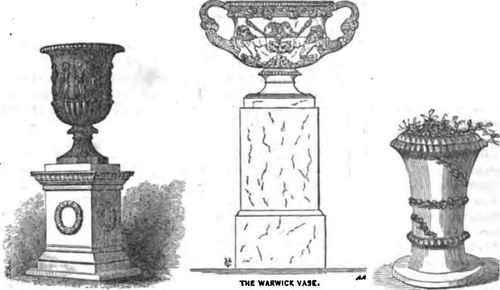 Vases for Gardens are beautiful when furnished with fine plants, and when so furnished, there are few objects more chaste or suitable as ornaments to those portions of a garden which are near the house. If filled with plants, they should all be growing, and in high, condition, the blooms mingling and clustering thickly in well contrasted colors. The verbenas mixed in this way, trail over, and produce a charming effect. Petunias, heliotropes, and other low-growing, half-creeping exotics, are excellent. The dark nasturtium also looks well when partially covering the base with pendent stems and rich blossoms. Geranium, cineraria, calceolaria, noisette roses, orange and lemon-trees, Collinsia, nemophilla, schizan-thus, balsam, cockscomb, anemone, and all kinds of bulbs, especially hyacinths, are suitable, though not so desirable as the perpetually blooming plants. The plants should all be grown in pots, and these set in the vases whenever it is desired to change them, which would be the case with hyacinths. The beautiful native, Mitchella repent of the woods, makes a good vase and hanging plant. The blue Lobelia is unrivalled. Very pretty wire baskets and vases are now made to set flower pots in, or for glasses to hold bouquets, of which the accompanying design is a specimen. "Better hang a wild rose over the toilette," says Leigh Hunt, "than nothing. The eye that looks in the glass will see there something of a right to respect itself, in thinking by how many objects in the creation the bloom of beauty is shared!" Speaking of breakfast, in summer, the same prince of essayists says: "Set flowers on your table - a whole nosegay; if you can get it, or but two or three, or a single flower - a rose, a pink - nay, a daisy. Bring a few daisies or buttercups from your last field walk, and keep them alive in water, and preserve but a bunch of clover, or a handful of flowering grass (one of the most elegant as well as cheapest of nature's productions), and you have something on your table that reminds you of the beauty of God's creation, and gives you a link with the poets and sages that have done it most honor. Put but a rose, or a lily, or a violet, on your table, and you and Lord Bacon have a custom in common; for that great and wise man was in the habit of having the flowers in season set upon his table morning, noon, and night - that is to say, at all his meals; for dinner, in his time, was taken at noon. And why should he not have flowers at all his meals, seeing that they were growing all day? Now, here's a fashion that shall last yon forever, if yon please-never changing with silks and velvets, nor dependent upon the caprice of some fine gentleman or lady. The fashion of the garments of heaven and earth endures forever, and you. may adorn your table with specimens of their drapery, with flowers out of the field's, and golden beams out of the blue ether".